Pagosa Springs has trails groomed specifically for fat biking and some great multi-use trails that are also great for fat biking. Riding is best done in the morning as the snow can get soft in the afternoon. Trails groomed for snowmobiling can also be great for fat biking. The Wolf Creek Trailblazers groom many miles of trails. Check their website for specifics. Need a fat bike? 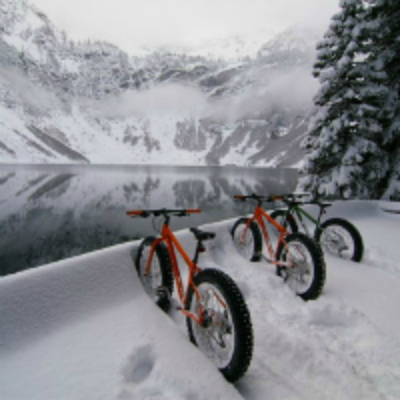 Pagosa Mountain Sports offers fat bike sales and rentals. 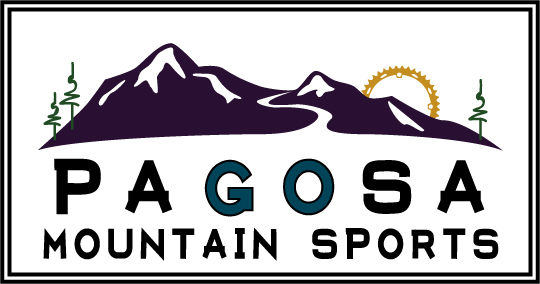 PMS gives Pagosa Nordic Club and Wolf Creek Wheel Club members 10% off retail on everything in the store! The trails groomed specifically for fat biking leave from the Main trailhead. 5.3 miles north on Piedra Road from the intersection of Piedra Road and 160 highway. Trailhead on the left as the road turns to gravel from paved. There is an ~7 mile loop and an ~12 mile loop. The snow has begun to melt at this location. Most of the trails and roads are still in pretty good condition with occasional bare spots under trees. A couple run off creeks have formed with shallow, quick water. There are currently ways around them without getting your feet wet. Snowmobiles have been illegally running on top of the trail groomed for fat bikes. While still rideable, their tracks can make the ride more of a challenge. The season is done at this location. Below is the map of the loops which are inked in black. Reservoir Hill is a Pagosa Springs town park located in the heart of downtown with trailheads within easy riding distance of a variety of downtown lodging establishments and public parking. Take U.S. 160 to downtown Pagosa Springs. Turn south at the Hot Springs Boulevard traffic light and take the second left onto San Juan Street. Look for a public parking area on the left. From the public parking area, it is a short uphill ride to the Spa Trailhead, which provides one point of access to Reservoir Hill. Reservoir Hill is not groomed but due to its popularity, these multi-use trails are often hard packed and rideable. From the intersection of Highway 84 and Highway 160, head east on Highway 160 for 9.6 miles. Turn right onto East Fork Road (USFS 667.) Continue on East Fork until the road is no longer plowed. This out and back is ~16km of road groomed for snowmobiles but offers a beautiful river side ride in a ponderosa pine forest. East Fork road is often groomed by the Wolf Creek Trailblazers. Check their website for specifics. From Highway 160, take turn north on Lewis Street and an immediate left onto 5th Street. 5th Street becomes Fourmile Road (County Road 400.) Continue on Fourmile until the road is no longer plowed. There will be a plowed parking lot. This out and back is 60km of road groomed for snowmobiles but offers a great ride close to town. Ride on Fourmile until the intersection with Plumtaw (USFS 667 / County Road 634). Turn left onto Plumtaw. Plumtaw road is often groomed by the Wolf Creek Trailblazers. Check their website for specifics. This out and back is on a road groomed for snowmobiles but offers a great ride close to town. 5.3 miles north on Piedra Road from the intersection of Piedra Road and 160 highway. Trailhead on the left just past the cattle guard. Park at the Main Turkey Springs trailhead. 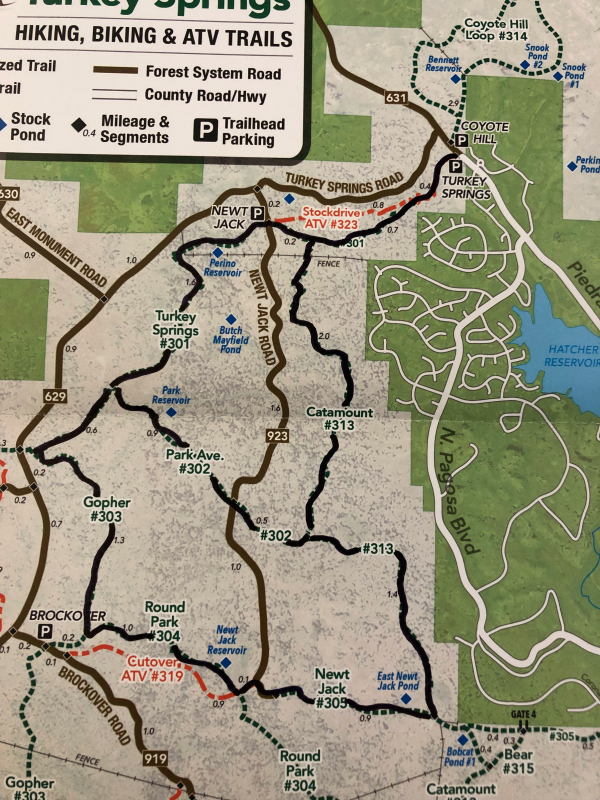 Ride down Piedra Road for 1/8 mile to Turkey Springs Road (USFS 146.) Turn left and continue on Turkey Springs Road for 2.3 miles to East Monument Road. Turn right onto East Monument which continues for 7 miles. These roads are often groomed by the Wolf Creek Trailblazers. Check their website for specifics. Yamaguchi Park is a Pagosa Springs town park located in the heart of downtown. Located on South 5th Street downtown Pagosa Springs.